Congratulations! You’ve just transformed your sleep with a CPAP machine. Chances are you’re sleeping better than ever and wondering how you survived without it. Every night you use it, you get better quality sleep and wake up more ready for what the day gives you. CPAP machines are amazing for interrupted sleep, but if you don’t clean them regularly, you could be breathing in mold and mildew from moisture building up. It’s critical to clean your machine regularly, but it can be a huge pain. It’s a simple system for sanitizing and disinfecting your CPAP without the hassle of cleaning by hand, but is it worth the investment? 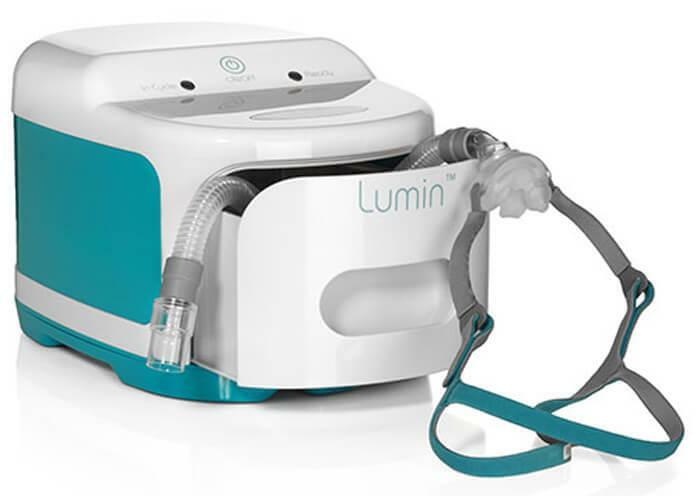 Let’s find out in our 3B Lumin CPAP Cleaner review. The Lumin uses the same type of UVC light used in surgical centers to quickly kill germs, bacteria, fungus, mold, and yes, even viruses. It’s quick and simple with a big enough chamber to handle your mask, hose, and water chamber without having to wipe off any residue. Plus, once the machine is finished, the CPAP machine is ready to wear immediately. It’s also suitable for cleaning other things in your house, such as toothbrushes, hearing aids, or even smaller children’s toys such as those chewing rings you worry about. It’s automatic and has a one-touch operation with a long-lasting UVC bulb that should outlast the life of the machine itself. The Lumin uses UV light, which destroys the cell body of most small organisms that contaminate your CPAP and cause disease. When you run the cycle, your CPAP is exposed to this light for the proper amount of time it takes for these organisms to die from exposure. UV only works on the surfaces, so Lumin’s container uses polished aluminum to reflect the light 360 degrees inside the compartment. You don’t have to worry about shadows or layers causing sanitation issues. When you load your equipment into the drawer, close it and push the start button. The Lumin will begin the cycle and alert you when it’s finished through another simple alert signal. Your CPAP has no wait time after the cycle is over. It’s ready to go right then. UV does need exposure time to be effective, so the machine takes about five minutes from start to finish. The green button tells you when it’s ready. Because you don’t have to wait for the CPAP to dry or wait for ozone to clear, you can clean your components even if you’re preparing for bed. UV light is significantly safer than using the most popular alternative. One popular way to disinfect CPAP components thoroughly is using activated oxygen, a highly effective disinfectant. Ozone floods even the inner chambers of the hose completely to rid the entire system of any potential organisms. The downside to ozone machines is that ozone is highly dangerous for human tissue, so there’s a waiting period of two to three hours after the machine cycles off before the CPAP is completely safe for use. That might be fine in a sleep clinic, but experts worry about whether home users are following the rule sufficiently to avoid contamination. UV light is a much safer alternative to Ozone, and once the exposure is over, the threat to your health is over. The drawer for the Lumin has a safety features so that if it’s opened, the UV features is automatically shut off, limiting exposure. 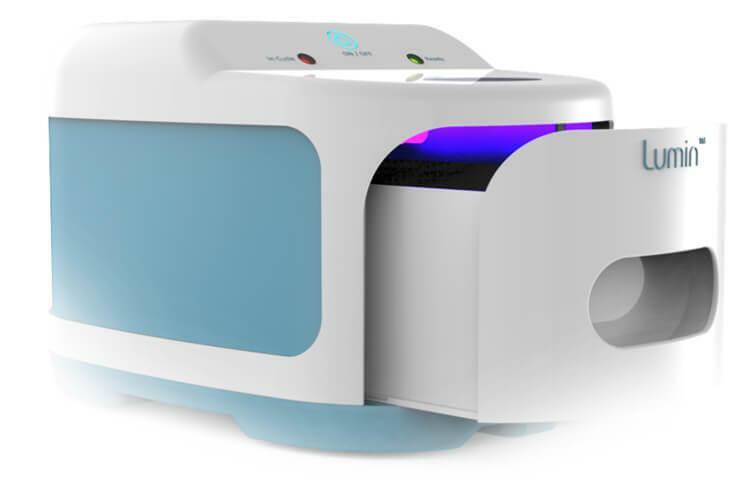 Even if it’s in the middle of a cycle, once the drawer opens, no UV emits from the machine. Experts recommend sanitizing and disinfecting your CPAP machine at least once a week. Most experts recommend taking the machine apart and scrubbing the components in soapy water, but it can be challenging to reach all the ridges and crevices. 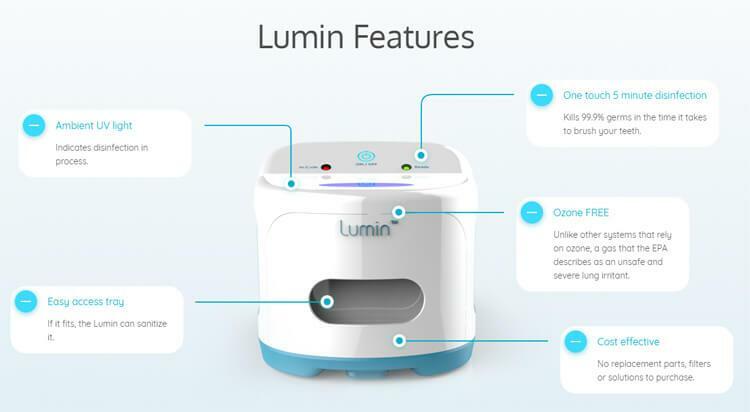 You may want to soak the parts in soapy water once every few weeks or so, but running the Lumin once a day, should keep your machine ready for use. It doesn’t change expert recommendation to replace the hose every couple of months or the mask piece every quarter, but it will help you keep your CPAP much cleaner in the meantime. The biggest draw of the Lumin is that you can be consistent with your cleaning instead of putting things off until the last minute like many soap and water users do. There are a few key benefits to deciding to use the Lumin. Let’s break it all down. Consistency here is key. The machine isn’t cheap, but sticking with the cheapest option, soap and water, has quite a few drawbacks. If you tend to put off cleaning your machine because the day gets away from you and you don’t have time to allow it to dry, the Lumin system is probably a good choice. Alternately, using activated oxygen may be slightly more effective, but it’s more than slightly more dangerous. Plus, you still have a wait time between when the cycle finishes and when you’ll be able to use your machine. That wait time could also translate into putting off cleaning for far too long. The Lumin allows you to clean your machine quickly and then use it right when it’s finished. Forgot to clean your CPAP machine and now it’s bedtime? Take five minutes, and it’s done. There’s no need to put things off, so you’re far more likely to sanitize every day, keeping your machine a lot cleaner overall. It has a built-in safety feature in the drawer to prevent UV exposure. You don’t have to worry about curious children accidentally damaging eyes and skin, for example, or forgetful spouses. The cycle automatically shuts off the moment the drawer comes unlatched. There’s no chance of UV exposure, so you don’t have to hide your machine or store it out of sight. UV can cause degradation of plastics over time, which may be cause for concern. However, that degradation occurs after 200 hours of exposure to UV light. If you use your Lumen daily for a year, it translates to just under 31 hours of exposure. Considering you need to replace components well before the year mark, the machine shouldn’t cause any significant degradation that could affect the safety and quality of the plastics. 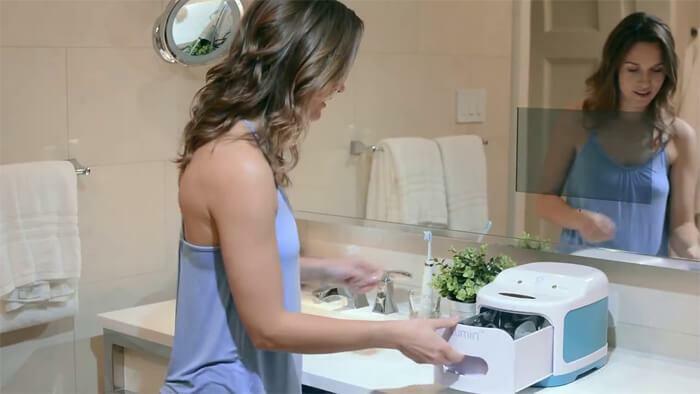 It sanitizes other household items just as well as the CPAP components. You can clean toothbrushes, makeup brushes, smaller toys, bottles, and most other types of plastics that you worry about. The drawer is much bigger than other types of sanitizing machines because you need room for all your components, so you’ve got a lot more space to work with. Because each cycle only takes about five minutes, there’s no worry you’ll start a cycle with something else and run out of time for your CPAP components. Investing in the machine gives you cleaning power for quite a few commonly dirty items in your household that may not get cleaned otherwise. The cycle is easy to control with just two lights indicating where you are in each cycle. Open the drawer and put the components in. Push the “on” button. A red light on the left tells you that it’s in the middle of a cycle while the green “ready” light tells you that the cycle has completed. There’s nothing to adjust or interpret, and even someone highly unfamiliar with these types of systems can learn to use this one. This system particularly benefits older users who may not be able to remember all the components of more complicated machines. The simplicity also ensures that you don’t risk your health not giving the proper wait period after sanitization like what happens after ozone based machines. It’s definitely more expensive than simple soap and water. While we’re definitely in support of investing in machines that make the long term maintenance much more manageable, if you’re on any kind of medical assistance with your CPAP, it’s unlikely that assistance extends to a sanitizer. UV only handles what’s on the surface. The company uses polished aluminum to help direct the light more fully around the drawer, but you may still worry about the inside of hoses. The company is reasonably sure that most hoses are transparent enough that UV can still penetrate to disinfect but acknowledges that it’s impossible to tell with all the varieties of hoses out there. A UV sanitizer isn’t going to remove actual grime from your components. If you’ve neglected to clean it for a while or you have a build up of dust or film of some kind, you’re going to have to scrub the parts to remove the buildup first. If you don’t, you’ll have sanitized the surfaces of your CPAP while leaving pockets of protected grime within the ridges and folds of the machine. Here are some important things to keep in mind when you’re deciding about the 3B Lumin CPAP Cleaner. households with multiple things to sanitize and disinfect. 99% effective against bacteria, mold, mildew, and viruses. The 3B Lumin CPAP Cleaner is an excellent investment for CPAP users who need an all-purpose sanitization device to make sure cleaning happens consistently. That’s what the Lumin really offers you, consistency. In just five minutes a day, you can effectively handle sanitizing your CPAP components, so you don’t have to worry about mold or fungus building up inside the system or about viruses that might be making the rounds. You’ll still have to scrub the components periodically to handle any filmy buildup, but for the most part, it handles your sanitization needs quickly. There’s no waiting period, so you can even manage that right before you need to use it if you tend to forget until the last minute. It can also handle other products such as toothbrushes, other oral paraphernalia, toys, hearing aids, or anything else that requires regular sanitization. We definitely recommend it if you can swing the budget because you may just save on doctors visits in the long run. It’s a simple-to-learn system that requires no training and can get you back on the road to sleeping not just better but healthier.